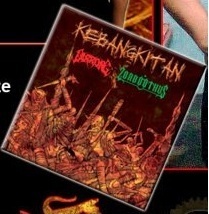 RANDOM: LARRONG / ZORBOOTHUS "Kebangkitan"
This split is a compilation of both band's releases spanning years of existence. I'm especially excited to hear the LARRONG side, since that my last encounter with them is the esteemed "The Eastern Shaman" promo tape back in 1996. But more on LARRONG later, because ZORBOOTHUS get the nod to start up things here. ZORBOOTHUS' tracks are taken from 4 separate releases, the oldest being the "Unharmonycalism" EP from 1999. Originated from Indonesia, you will get the picture more or less if I tell you that they deliver brutal death Metal. Yes, brutal death Metal the Indonesian way. Plus minus, it is what you will get from most of the brutal death releases there. And you know how good some of them are, so this is not bad, but very much in the frequently expected traits. They tend to 'slow' things up on the last song here, 'Seruan Setan' which unlike the others here, doesn't possess any blastbeat parts therein. I bet it is the odd one in their discography though, ZORBOOTHUS is primarily brutal guttural death Metal to the bone. Ok, so now comes LARRONG. They begin with their most recent output, the tracks from "Nuclear Armageddon" EP 2012. Probably it is no surprise to some, but as this is my chance to encounter them again after those years, I might not recognise this as the LARRONG of the 90's. They are strictly more death Metal nowadays, which put extra care on being aggressive and leaving behind that blackened vibe from the younger days. I have to change my perception of them from now on, the new LARRONG is some aggressive Borneo death Metal act, with suspects of having a usual diet of modern European death Metal to some extent. Decent, totally decent materials. The 'Narratik' single from 2008 brings back that "The Eastern Shaman" feel, yet I do find it more primitive and simpler than the promo. The tracks from "Dakan Perana Tana" EP 2002 shows yet another side of the band. Here they are in for some blackened death Metal (with drum programmings?) journey that, feels rigid and sterile due to that drum sound. The guitars show tendency towards the Norwegian black Metal nod, apart from death Metal. They close things up with a couple of live tracks, including the compulsory "The Eastern Shaman", which shows yet again why their 1996 promo tape is such a gem. The songs feels just right for its era, even though in its crude live recording condition. Let's see how far they can push their death Metal nowadays. Or they might change again on the next release? Being a band that almost single-handedly shape the scene in their area (at least 2 bands were named from their song-titles), LARRONG will prevail, most probably.